So when I discovered I had miraculously recovered and was able to run, I knew that last week’s trip to Cairns would be much more successful. Triathlon training when you’re travelling can be tricky, as can maintaining any form of exercise. I would love to share with you some foolproof tips to guarantee that you will not have to skip your workout when you’re away from home, but I don’t think it’s possible. Sometimes everything is against you and you just have to write one off to the Law of Sods. But hopefully you can incorporate it as an official rest day (yes, those are allowed) and not worry about it too much. SIDENOTE: It’s sad but true (and worth noting here I feel) that you won’t be able to partake in triathlon frivolities if you lose your job and are unable to pay for your energy gels/running shoes/race fees etc. So when I have to skip a training session because I am working an extra long day, I try not to feel bad about it. Likewise with walking my dog, which sometimes has to take precedence over a session I had planned on doing because I did choose to have a dog and she does require exercise herself occasionally. Looking after one’s children would probably be another priority to put above training every now and then, I imagine. Not that I am telling you how to be a parent, I’m just guessing. In saying that, sometimes what you think will be an impossible mission is actually a great opportunity IN DISGUISE! A few weeks ago in the parkrun newsletter (a weekly email which I highly recommend you sign up for even if you haven’t done any parkruns yet) I read about a couple who were going on a cruise for a week and missed their Saturday morning parkrun so much that they decided to organise a ‘parkrun’ on the deck of the boat. I don’t recall how many times they had to run around the deck to achieve 5km, but it was quite a few. They’d advertised the event on the noticeboard of the ship and had 5 people attend their ad-hoc run, which I thought was quite impressive. Some people are so inspiring. But you’re not here for inspiration I hope, because I’m flat out organising how many pairs of knickers I need to pack in my suitcase. And you wont see me rallying the troops to conduct coordinated exercise in the aisles of the airplane any time soon. 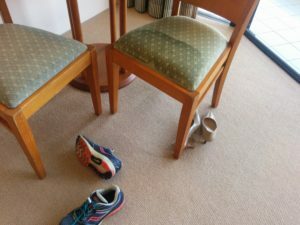 Anyway when I travel, I’m usually not in such a bind that I need to organise a run around the deck of a boat, and I must admit I usually try to pick a hotel that has at least an exercise bike or some kind of machine to workout on to make life easy on myself when all else inevitably fails. But even then I scale back my exercise expectations when I’m away from home and try to focus on maintaining the routine of working out each day, even though I am probably doing it at the ‘wrong’ time and there is no semblance of routine about it. If I do not turn into a piece of chocolate cake while I am travelling, I count it as a win. Running is one of the easiest activities to fit into a holiday, of course. With no equipment required other than my clothes and running shoes, a short 5km run is usually achievable wherever I go. SIDENOTE: A longer run may require water bottles, a hat, sunglasses and a map, but is still easy to arrange if you’re a bit less scatterbrained than I. It’s also a great way to do some sightseeing of your temporary home-away-from-home. My run up Castle Hill in Townsville is a good example of this. ANOTHER SIDENOTE: The obvious exception to the ‘easy to arrange 5km run’ is when there is no opportunity to run while it’s still daylight (do NOT go running in the dark, in a town you don’t know, by yourselves!) or if I am injured, which has been the case for most of my running career. 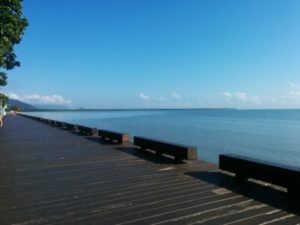 The boardwalk, on which you can run or walk whilst in Cairns. Shane and I have chosen to visit Cairns quite a few times since I moved to Australia and it’s one of my favourite places to go on holiday. There are a lot of activities in Cairns that fit the category of ‘things I like to do when relaxing’ like seeing magnificent waterfalls, hiking through the rainforest, driving quad bikes, eating lots of food, drinking lots of beer, shopping, sightseeing, etc. So I was familiar enough with the city to know that you can run along the esplanade for about 2.5km before turning around to total 5km by the time you arrive back at the starting point. It would be flat, the scenery would be nice and there would be no chance of getting lost. Tick, tick, tick. Stupidly, I set my alarm a bit later than ideal. It did not occur to me that the sun would be beating down upon me by 7am and cause me to almost pass out from heat exhaustion. After a bit of a late night, I decided that a lie-in would be a well-deserved treat. But as I left the air-conditioned comfort of the hotel, I immediately wished I had set out earlier. I’d done my warm-up in the hotel room, so my ego was thrilled to be able to stroll out of the lobby and immediately break into a jog, no doubt making all the people milling around waiting for their tour buses terribly jealous of me. I don’t know why I assume this was the case – perhaps it’s because I am generally jealous when I see someone out running or biking and I’m stuck behind a driving wheel. Or maybe it’s because I spend so much of my time unable to run that when I actually get to do it I assume everyone is in awe of my ability to overcome creaky old hips and joints. In which case my ego clearly does not understand that there are only three people reading this blog, if you count my split personality and Grandpa, so nobody else knows about my running problems. As soon as I stepped out onto the pathway, the sun hit me and I realised I wasn’t about to break any PBs. 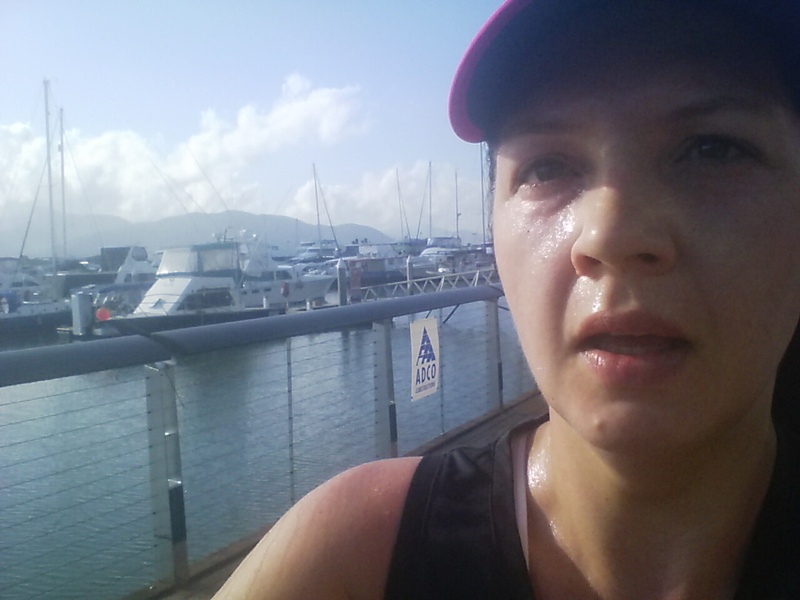 But having stuck to the shorter runs for a week, I was simply happy to attempt a whole 5km and I decided the heat would be good training for Noosa (because by the time I get to the run section of that race it is likely to be the middle of the day) so a PB-less run was OK by me. Cairns Esplanade. A bit wonky because it’s hard to get the camera level when running. Those who haven’t been to Cairns may be under the impression that it is a quiet, remote city. I have never found that to be the case. 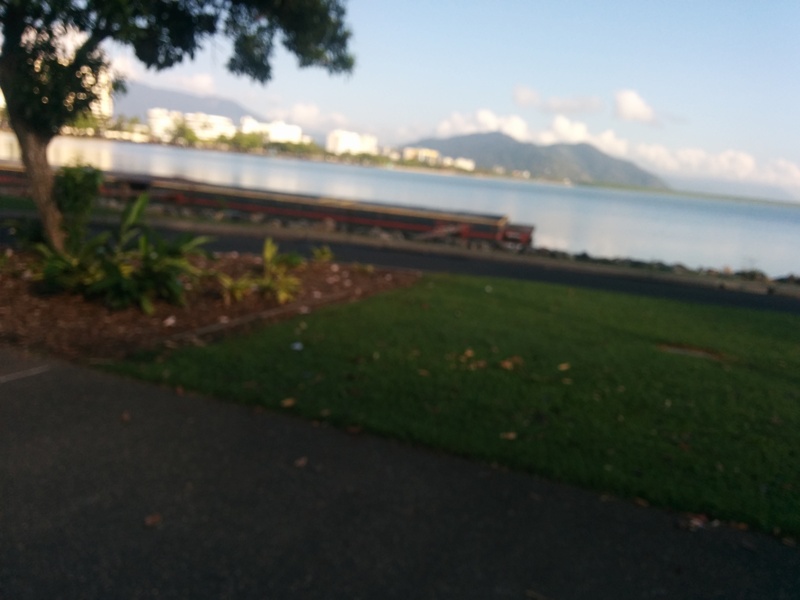 There is something going on in Cairns ALL THE TIME (which is one of the reasons it’s so great to visit for a holiday in my opinion) and I was surprised how many people were already out and about in the morning sunshine. 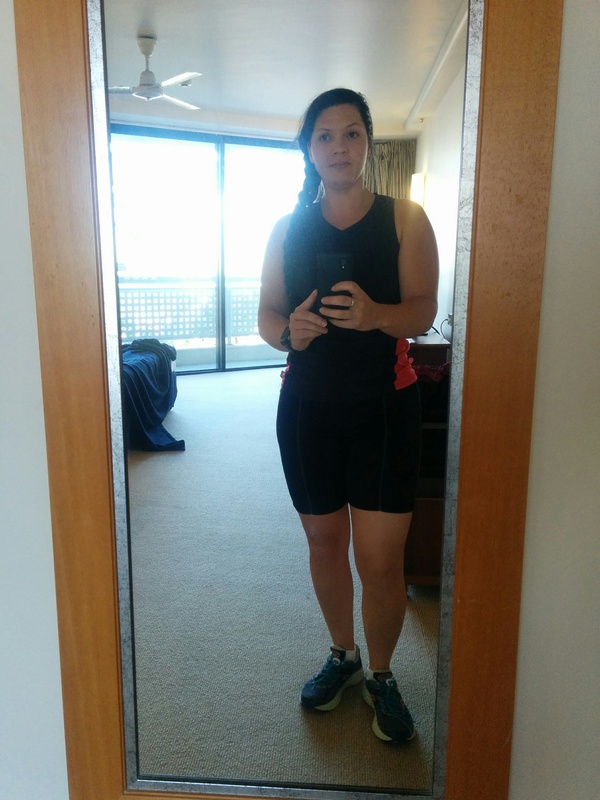 This made it a bit embarrassing for taking run selfies (because I am sure I look like an egomaniac taking pictures of myself running – I need a sign that says ‘I have a blog!’) but gave me some great opportunities for people watching as I ran. People watching, which turned into people thinking. Let me explain. First up, after settling into a nice steady rhythm which I thought would be sustainable for 5km, I ran past some tennis courts where a middle-aged couple were engaged in a fierce match. This made me think of my mum and stepdad, who are avid tennis players and very good at it. 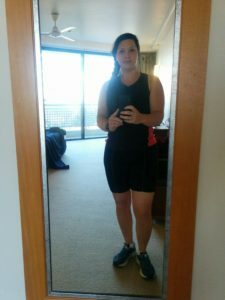 As I pushed into my first sweaty kilometre, I thought about the time my parents have spent watching me do triathlons, listening to me whinge about triathlons, and reading this blog about triathlons. I ran along thinking about them both and feeling grateful that I have such supportive parents. As I started to approach the main part of town, I spotted an older man ahead of me walking a cattle dog. This immediately made me think of Grandpa and my beautiful dog Matilda, who are two of my favourite things on the planet. I imagined how nice it would be to run up behind them and stop for cuddles. I looked down at my watch (the one Grandpa bought me) to see how far I had come and my heart sang for the next kilometre. Pushing on past the marina and seeing all the boats made me think of Shane, my partner. We’ve caught a multitude of boats from the Cairns Marina, taking trips along the Trinity Inlet, tours over to Green Island and charters out for fishing and crabbing sessions. Shane is a water baby who hates to swim, and for the next one thousand metres I thought of him and his paradoxical ways. You guessed it – this photo was also NOT selected for Instagram use. Because this is real life and Instagram is not. Having turned around and commenced making my way back to my hotel, I pushed past the 3km mark that had been my stopping point for the previous week. My longest run was upon me. And as if in answer to my doubts about whether I could finish the whole 5km, I ran past two young children who stood either side of the path and clapped me. Their mother laughed and pulled them away as I passed, but they made me think of my two cheeky nieces who I always imagine are on the sidelines of the races I do. Thoughts of my three favourite girls consumed me until I reached the final stretch, when I did a mental check that I had enough photos for the blog. And thinking of the blog, I realised how helpful it has been to document the highs and lows of the various training sessions I have done this year. 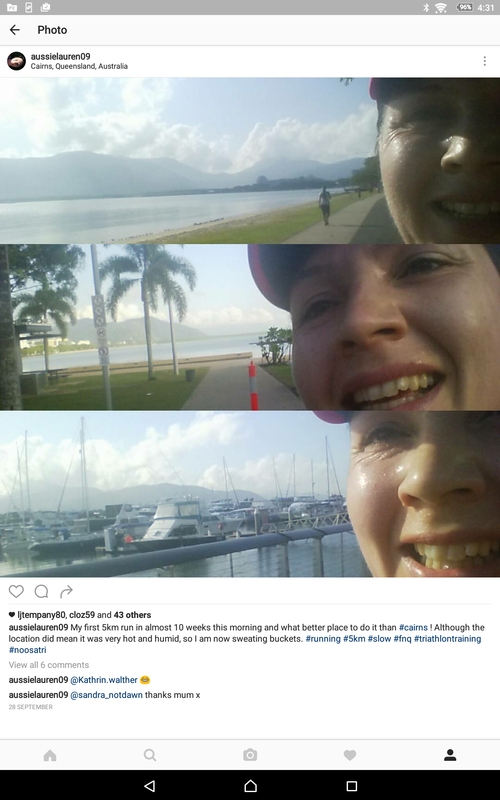 With just weeks to go until the big day (The Noosa Tri I mean) I am glad that my sister cajoled me into keeping this record of my adventure, because the support I’ve had and the comments some of you have left have made all the difference. And I have been surprised to find that some of the biggest injections of motivation have come from not wanting to let my few blog readers down. When I got back, I selected some photos that appeared to show me enjoying my run and posted them on Instagram. Look closely at my Instagram post (pictured above) and compare them to the rest of the photos in this post. You will notice that I selected different photos, which paint a more realistic picture, for use here on the blog. Because I know I can’t fool any of you into thinking that running is easy or fun or attractive. I perched on the edge of a chair to remove my shoes for a few seconds. When I stood up, I realised just how much I was seating. I perched. I did not wet myself, although it thus appears. I left a note for the cleaners apologising but not explaining the wet patch. Because I couldn’t decide whether it was worse that I had sweated on the chair or wet myself on the chair. It will be a few more months until I return to Cairns (in an attempt to avoid the worst of the summer months) but I know it will only be a few days until I attempt another run. With 5kms done, it will soon be time to step up to 10km. Which is a satisfying feeling indeed. 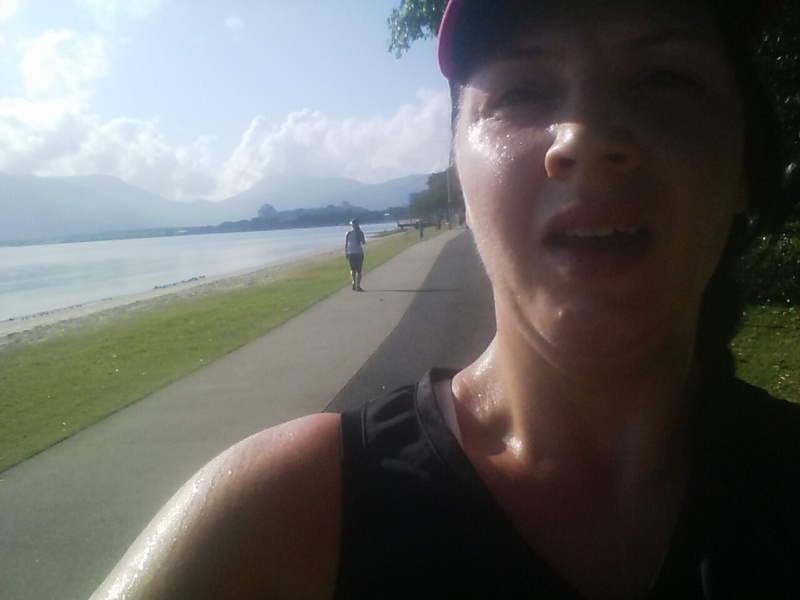 This entry was posted in Show Me Run and tagged dog, ego, family, newbie, noosa, running, Shane, training. Bookmark the permalink. Great blog again! I always feel like I’ve been right there with you when I read the blog. And I love the comment about Insta! 😂 thanks, I thought it was a good opportunity to point out the difference between the blog and Insta! I am glad you liked the post. A lovely way to enjoy the time passing when on a run. I am doing a 5km run next Sunday around a nature reserve, though I may have to take a bit of care (have already downgraded from 10km) as my knee has started playing up. Visited physio yesterday and got some good advice and exercise. Certainly not going to let it slow me down though. I can guarantee that the weather won’t be as hot as you’ve experienced! I can’t believe I forgot to reply to this! 😱 Your run! How did it go? I hope your knee is alright. I have met so many people who can’t run because of their knees, it has got to be one of the hardest injuries to contend with. I am glad you visited the Physio and I hope that he or she gave you the all clear. You are crazy and brave!